The history, the romance, the ever-changing vistas as you glide along the iconic Danube, Main and Rhine rivers of Europe; this 17 day fly and river cruise package is the perfect way to experience the diverse wonders of five incredible countries in comfort and style - at a price everyone can afford. Fly to Amsterdam, the cosmopolitan capital of The Netherlands, and embark on a 14 night river cruise aboard the 5-star Amadeus Brilliant ship. Indulge with gourmet meals, free-flowing beer and wine with every lunch and dinner onboard, as well as special onboard entertainment as as you make your way along the scenic Danube, Rhine and Main rivers. Cruise to historic Cologne; visit Oberwesel, known as the ‘City of Towers’; visit the world-famous wine-growing area of Durnstein; admire the well-preserved medieval architecture of Regensburg; enjoy a day at leisure in cosmopolitan Vienna; soak up the charm of Slovakia’s vibrant capital, Bratislava; relax with two days at leisure in Budapest and much more! This incredible package includes return international flights, English-speaking onboard Cruise Director, 41 meals and more. Want to tick more off your European bucket list? Choose the 26 day package with Taste of the Balkans extension to explore diverse countries including Croatia, Albania, Bosnia & Herzegovina and more! Today depart from either Sydney, Melbourne, Brisbane, Adelaide or Perth for Amsterdam, The Netherlands! Fly with either Emirates, Singapore Airlines, Etihad Airways or Cathay Pacific to name a few (subject to availability). Welcome to Amsterdam. Upon arrival make your own way to the cruise port, and board your home for the next 14 nights. Spend the afternoon settling in to your floating home docked in the canals of Amsterdam. Enjoy time free at leisure in the Netherlands’ capital, known for its artistic heritage, elaborate canal system and narrow houses with gabled facades, legacies of the city’s 17th century Golden Age. This evening, enjoy a welcome cocktail and dinner on board. Today you will depart Amsterdam for Cologne, with a short stop in Utrecht. 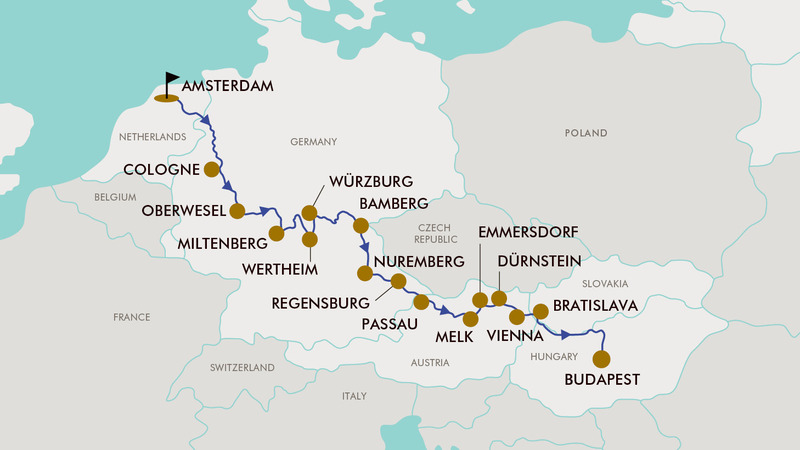 Begin your exploration with a relaxing cruise through a myriad of landscapes along the Rhine river. Discover this 2000-year-old city spanning the Rhine River in Western Germany at your leisure. It’s the region’s cultural hub, a landmark of High Gothic architecture set amid the reconstructed old town. The twin-spired Cologne Cathedral is also known for its gilded medieval reliquary and sweeping river views. Early this morning, join your fellow travellers on deck as you pass through the famous passage of the Lorelei. This narrow passage on the Rhine has inspired a modern-day folklore story of the siren (or water spirit) of the river. After breakfast the ship docks in Oberwesel, the “City of Towers”. You can either explore the city on your own or take the opportunity to join a walking tour around the wall that still surrounds much of the city (not included). There are a large number of churches, as well as many historic houses that showcase the architecture of the 17th and 18th centuries. Today you can choose to remain onboard for a relaxing day or take the opportunity to join an optional excursion to the historic townships of Miltenberg and Wertheim (not included). See the historic town of Miltenberg on the Main River. Some of Germany’s most beautiful timbered houses can be found in Miltenberg; considered a traditional village located in the Lower Franconia district of Bavaria. Wertheim, was founded between the 7th and 8th century, and is best known for its landmark castle and medieval town centre. Arrive in Wurzburg - a Bavarian city at the centre of Franconian wine country, renowned for lavish baroque and rococo (late baroque) architecture. It’s home to numerous wine bars, cellars and wineries that are waiting to be discovered and sampled. Relax in the afternoon and enjoy a sumptuous dinner tonight. Relax this morning while cruising the beautiful Main River to the UNESCO protected Imperial city of Bamberg. Its old town preserves structures from the 11th to 19th centuries including the mural-adorned Altes Rathaus, which is on an island in the Regnitz and accessed by arched bridges. This evening, transit the Main and Danube Canal, and learn about this important waterway with an onboard talk. Following breakfast, enjoy your day in the romantic old town of Nuremberg. Though largely destroyed during WWII, it has been lovingly restored and is distinguished by its medieval architecture, including the fortifications and stone towers of its Altstadt (Old Town). This afternoon the ship docks at one of Germany’s most well preserved medieval cities. Regensburg is located on the most northern point of the Danube River and is known for its UNESCO world heritage architecture from many different centuries. The 13th century Regensburg Cathedral, a twin-spired Gothic landmark, is home to the Regensburger Domspatzen choir, just one of the many highlights of this city. This evening enjoy a special Bavarian themed evening celebrating the wonderful region you have been cruising. Passau, a German city on the Austrian border, lies at the confluence of the Danube, Inn and Ilz rivers, and is known as the ‘Three Rivers City’. The town is overlooked by the Veste Oberhaus, a 13th century hilltop fortress housing a city museum and observation tower. The old town below is known for its baroque architecture, including St. Stephen’s Cathedral, which features distinctive onion-domed towers and an organ with 17,974 pipes. Enjoy dinner as the vessel sets off toward the romantic Wachau Valley. Early this morning, dock in Emmersdorf, in the heart of the UNESCO protected cultural heritage landscape of the Wachau Valley. Travel to Melk, known for the 11th century Melk Abbey - a vast monastery built high above the town. Gold statuary adorns its domed Abbey Church, and the huge library houses medieval manuscripts. The Marmorsaal is a baroque hall with a ceiling fresco and red marble walls. South of Melk, gardens surround the Renaissance Schallaburg Castle, which hosts cultural exhibitions. Durnstein is a small town on the Danube River and it’s one of the most visited tourist destinations in the Wachau region. Take the opportunity to join an optional walking tour and wine tasting in Durnstein (not included). The Wachau Valley is an Austrian region near the Danube River, west of Vienna. It’s known for its rolling hills, vineyards and fortresses. Arrive in Vienna this evening at approximately 7:30pm. Tonight, don’t miss the opportunity to enjoy the “Sound of Vienna” concert (not included). There is much to see in Vienna, Austria’s capital city. It lies in the country’s east on the Danube River. Its artistic and intellectual legacy was shaped by residents including Mozart, Beethoven and Sigmund Freud. The city is also known for its imperial palaces, including Schonbrunn, the Habsburgs’ summer residence. In the Museumsquartier district, historic and contemporary buildings display work by Egon Schiele, Gustav Klimt and other artists. Bratislava, the capital of Slovakia, is set along the Danube River by the border of Austria and Hungary. It’s surrounded by vineyards and the Little Carpathian Mountains and is crisscrossed with forested hiking and cycling trails. The pedestrian only, 18th century old town is known for its lively bars and cafes. Perched atop a hill, the reconstructed Bratislava Castle overlooks old town and the Danube. Tonight, you will enjoy the Captain’s Gala Dinner. The beautiful Hungarian capital of Budapest is a perfect finale to your trip. One of the largest cities in the European Union, it’s bisected by the Danube River. Its 19th century Chain Bridge connects the hilly Buda district with flat Pest. A funicular (cable railway) runs up Castle Hill to Buda’s Old Town, where the Budapest History Museum traces city life from Roman times onward. Budapest offers many interesting sites, including the largest building in Hungary, the neo gothic Parliament building, Fisherman’s Bastion. This evening enjoy a Hungarian folklore show as the ship cruises the Danube to view the beautiful city by night. This morning after breakfast you will disembark and make your own way to the airport for your return flight back to Australia. Please note: if your flight departs early, breakfast will be arranged for pick up from the hotel reception the night before. Early this morning, dock in Emmersdorf, in the heart of the UNESCO protected cultural heritage landscape of the Wachau Valley. Travel to Melk, known for the 11th century Melk Abbey - a vast monastery built high above the town. Gold statuary adorns its domed Abbey Church, and the huge library houses medieval manuscripts. The Marmorsaal is a baroque hall with a ceiling fresco and red marble walls. South of Melk, gardens surround the Renaissance Schallaburg Castle, which hosts cultural exhibitions. Durnstein is a small town on the Danube River and it’s one of the most visited tourist destinations in the Wachau region. Take the opportunity to join an optional walking tour and wine tasting in Durnstein (not included). The Wachau Valley is an Austrian region near the Danube River, west of Vienna. It’s known for its rolling hills, vineyards and fortresses. Arrive in Vienna this evening at approximately 7:30pm. Tonight, don’t miss the opportunity to enjoy the “Sound of Vienna” concert (not included). This morning, after breakfast, you will disembark the cruise and begin the drive to Zagreb! Croatia’s capital city, Zagreb, is distinguished by its 18th and 19th century Austro-Hungarian architecture. Upon arrival, be transferred to the hotel. This morning after breakfast enjoy a half day guided tour and see the main city’s highlights such as the fortified Upper Town, the city’s historical centre, St Mark’s church with its multi-coloured roof, the Croatian National Theatre and the University (entrances not included). In the afternoon continue to Sarajevo, the capital of Bosnia and Herzegovina. After breakfast enjoy a half day guided tour of Sarajevo. Ringed by mountains, Sarajevo is a city with an East-meets-West vibe . It was once renowned as a religious melting pot, earning it the epithet 'the Jerusalem of Europe'. Within a few blocks you will see large Catholic and Orthodox cathedrals, the famous Bascarsija, Old Bazaar and its historical and cultural city centre as well as Synagogue, Khosrov Bey and Ferhadija mosques. In the afternoon continue to Mostar, a city in southern Bosnia and Herzegovina, straddling the Neretva River. It’s known for the iconic Stari Most (Old Bridge), a reconstructed medieval arched bridge. Upon arrival enjoy the remainder of the day at leisure to relax or explore this remarkable city. This morning continue on to the spectacular old town of Dubrovnik. On the way make a stop to Počitelj, a historical village and open-air museum. The village is a medieval and Ottoman-Mediterranean wonder of nature and architecture. Upon arrival to Dubrovnik enjoy the rest of the day at leisure to take the opportunity to admire the UNESCO listed old town of Dubrovnik, the Pearl of the Adriatic. Have a walk through the narrow streets of the Old Town, introducing you to the history and culture of this magnificent city. After breakfast depart for Budva a popular tourist spot in Montenegro. On the way stop at Kotor, one of the most beautiful cities in Montenegro and Balkan region. Continue on to Sveti Stefan, a small islet and 5 star resort on the Adriatic coast of Montenegro, approximately 6 kilometres southeast of Budva, with lush grounds and stunning sea views. Take in the stunning surroundings this resort has to offer before you continue on to Budva, a city known for its sandy beaches and vibrant nightlife. Upon arrival to Budva, enjoy a walking tour with your Tour Leader to see the cities highlights. Stone walls built by the Venetians surround the narrow streets of the medieval old town (Stari Grad). This morning head towards Tirana, the capital city of Albania. On the way, stop in Podgorica, the capital city of Montenegro, passed through the hands of everyone from the Romans to the Turks to the Austro-Hungarians, and twice been wiped off the map entirely. Upon arrival to the beautiful city of Tirana, enjoy a walking tour with your Tour Leader see the main highlights Ethem Bey Mosque, Historical Clock Tower and more (entrances not included). Tirana is the heart and capital of Albania, like all other European metropolises the city has never-ending movement and energy. With its clubs, bars, cafes, and taverns, Tirana is worth discovering by both day and night. After breakfast depart to the capital City of Macedonia, Skopje, on the way stop on the shores of the UNESCO listed serene Lake Ohrid, the border between Albania and Macedonia. Arrive at Skopje and enjoy the remainder of the day at leisure. Today enjoy a half day guided tour of the city. Walk through the stone streets, historical buildings, the Turkish market and the jewellery streets in the Bazaar. See sites such as the Skopje Castle, Vardar River, Stone Bridge and the Turkish and Jewish quarters. A long the way you can admire the gigantic sculpture of the great Alexander the Great, see the Mother Teresa Monument and the Mother and the Mosques of the city (entrances are not included). Enjoy the afternoon at leisure. Enjoy today at leisure in the Macedonian capital city, Skopje. After breakfast transfer to the airport for the return flight back to Australia. Please note: if your flight departs early, breakfast will be arranged for pick up from the hotel reception the night before. Travel offer is valid for travel on the 5th May 2020. Etihad Airways, Emirates, British Airways, Singapore Airlines, Cathay Pacific, Virgin Atlantic, Royal Brunei, Lufthansa, Swiss Airways, Austrian Airlines, Scandinavian Airlines, Qatar Airways, Air France, KLM, Finnair, Virgin Australia, Thai Airways, Korean Airlines, Malaysia Airlines, China Southern Airlines, China Eastern Airlines, Turkish Airlines, Oman Air, Garuda Indonesia, Vietnam Airlines, Air China, China Airlines, Malindo Airlines plus codeshare partners (subject to availability). - If you are interested in this stay behind option, please contact our friendly reservations team at TripADeal to make this booking and provide your preferred travel dates. This stay behind option is not available through the online check out. - Only an outbound OR inbound stopover may be chosen, not both. - *Starting from quotes will be processed and returned for your consideration. Panoramic windows (cannot be opened), (15 m² / 161.5 sq.ft. ), ample closet space double or twin bedding, flat-screen television, individual climate control, en-suite bathroom with shower/WC, hair dryer, direct dial telephone and in-room safe. Panoramic windows (cannot be opened), (15 m² / 161.5 sq.ft. ), ample closet space, double or twin bedding, flat-screen television, individual climate control, en-suite bathroom with shower/WC, hair dryer, direct dial telephone and in-room safe. Panoramic windows (cannot be opened), (10 m² / 107.5 sq.ft. ), ample closet space, single bed, flat-screen television, individual climate control, en-suite bathroom with shower/WC, hair dryer, direct dial telephone and in-room safe. Floor-to-ceiling sliding glass doors with French balcony, (15 m² / 161.5 sq.ft. ), ample closet space, double or twin bedding, flat-screen television, individual climate control, en-suite bathroom with shower/WC, hair dryer, direct dial telephone and in-room safe. Floor-to- ceiling sliding glass doors with French balcony, (15 m² / 161.5 sq.ft. ), ample closet space, double or twin bedding, flat-screen television, individual climate control, en-suite bathroom with shower/WC, hair dryer, direct dial telephone and in-room safe. Subject to availability and at the cruise’s discretion. Please enquire on booking if you require this option. - Concert "Sound of Vienna"
- prices are based on per person, are subject to availability, time permitting and weather conditions. - The optional tours listed above must be purchased on checkout or over the phone prior to submitting your passenger information form (subject to availability). May is one of the best times to travel. The weather is warmer, a fair bit of sunshine is likely, and the days are long. The countryside is green and verdant and covered in flowers and the daylight lasts long into the evening. The weather is warm and often sunny. It's the spring time of Europe. Daily breakfast is included in the tour on the 26 Day extension package, for all other meals; lunches and dinners the tour leader (when available) will offer assistance with reservations, suggestions and directions to local restaurants. It is your responsibility to notify TripADeal of any dietary requests/requirements. Please note; we will do our best to meet your requests/requirements, however cannot guarantee that we will always be able to. Gratuities (tips) are not included in the tour price for services of the tour leader (when available) and driver throughout the tour The recommended tip for cruise is USD12 per person per day (Approx. $17 AUD). For the 26 Day Extension package Gratuities (tips) are not included in the tour price for services received whilst not on the cruise, these are approximately €5 per person per day payable on tour (Approx. $8 AUD). A tourist visa for Europe is not required for stays up to 90 days if travelling on an Australian passport.